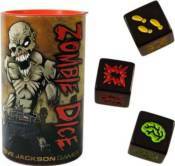 Zombie Dice Game:Eat brains and don't get shotgunned with the Zombie Dice Game! You are a zombie. You want brains! More brains than any of your zombie buddies. Zombie Dice is a quick and easy game for gamers and non-gamers alike. The 13 custom dice represent victims. Push your luck to eat their brains, but stop rolling before the shotgun blasts end your turn. Zombie Dice is a dice game for 3 to 8 players. Each game takes 10 to 20 minutes, and can be taught in a single round. Ages 10 and up.